The recent cold weather has allowed us to enjoy nice warm fires in the fireplace at home. 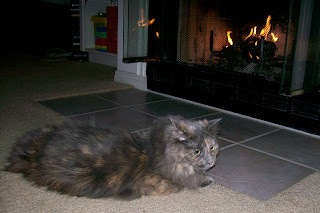 While we all like the warmth and ambiance of the fire, Gertrude seems to enjoy it the most. She will sprawl out in front of it for hours - or until Dawson comes by and decides it's time for a game of chase.